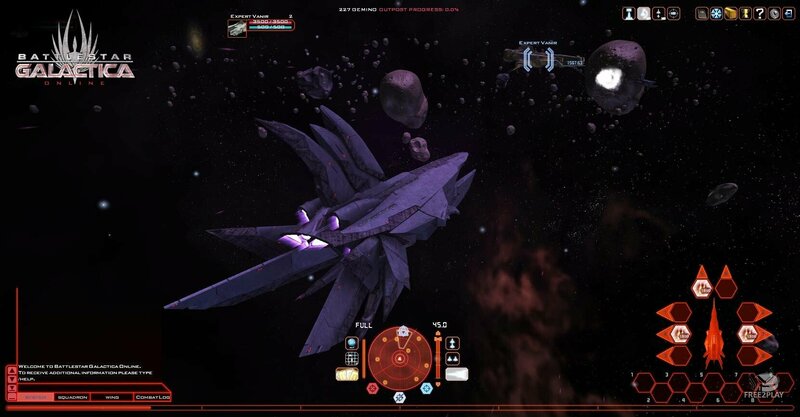 Battlestar Galactica Online is a f2p mmo game which puts you in the cockpit of a spaceship as Human or Cylon to join the battle between man and machine across the galaxy, with intense space combat and cutting-edge 3D graphics. - Choose your side: Play as either Cylons or Humans. - State of the art 3D graphics directly in your internet browser window. - Free to play, with micropayment options. 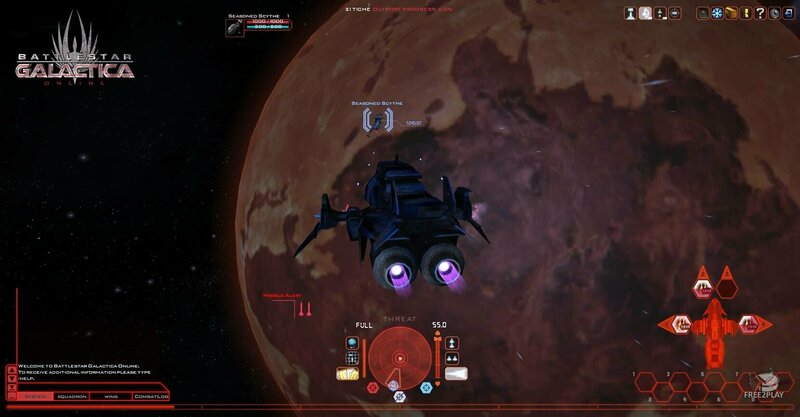 - Action-packed tactical space combat with a huge range of offensive and defensive systems. 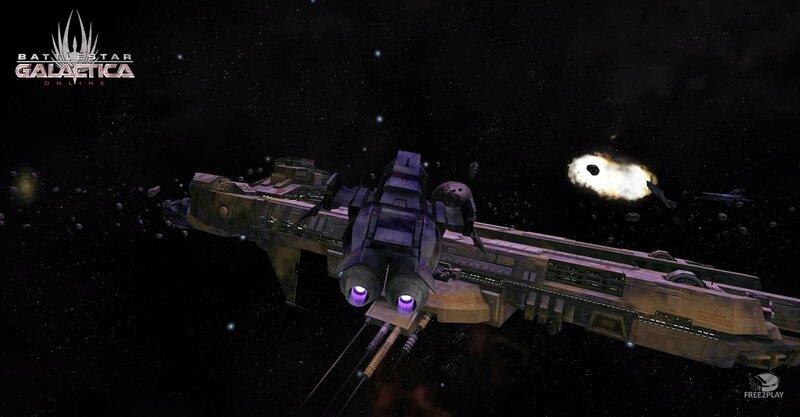 - A strategic battle for resources and territory between Human and Cylon players raging across dozens of star systems. - Story-based missions that delve into new aspects of the show’s universe. - Varied progression options that offer the freedom to create your ideal Battlestar Galactica character. - Multiple ships to command, with a huge variety of upgrades and customisation choices. As an Interceptor, the Viper Mk II can be equipped with more engine systems than other strike craft, increasing its already impressive performance. As a Command ship, the Raptor can be equipped with more computer systems than other strike craft, increasing its electronic warfare and support capabilities. As an Assault ship, the Rhino can be equipped with more hull systems than other strike craft, further increasing its toughness and defensive capabilities. As an Interceptor, the Scythe can be equipped with more engine systems than other escorts, increasing its already impressive performance. As a Command ship, the Glaive can be equipped with more computer systems than other escorts, increasing its electronic warfare and support capabilities. As an Assault ship, the Maul can be equipped with more hull systems than other escorts, further increasing its toughness and defensive capabilities. As a Heavy Interceptor, the Aesir can be equipped with more engine systems than other line ships, increasing its already impressive performance. As a Heavy Command vessel, the Vanir can be equipped with more computer systems than other line ships, increasing its electronic warfare and support capabilities. As a Heavy Assault vessel, the Jotunn can be equipped with more hull systems than other line ships, further increasing its toughness and defensive capabilities. As an Interceptor, the Raider can be equipped with more engine systems than other strike craft, increasing its already impressive performance. As a Command ship, the Heavy Raider can be equipped with more computer systems than other strike craft, increasing its electronic warfare and support capabilities. As an Assault ship, the Marauder can be equipped with more hull systems than other strike craft, further increasing its toughness and defensive capabilities. As an Interceptor, the Banshee can be equipped with more engine systems than other escorts, increasing its already impressive performance. As a Command ship, the Spectre can be equipped with more computer systems than other escorts, increasing its electronic warfare and support capabilities. As an Assault ship, the Wraith can be equipped with more hull systems than other escorts, further increasing its toughness and defensive capabilities. As a Heavy Interceptor, the Fenrir can be equipped with more engine systems than other line ships, increasing its already impressive performance. Obviously intended for use as a battlefield command and control platform, the recovered Hel class hulls are honeycombed with data processing, sensor and emitter plexuses that rival the capabilities of a Basestar hybrid. As a Heavy Command vessel, the Hel can be equipped with more computer systems than other line ships, increasing its electronic warfare and support capabilities. 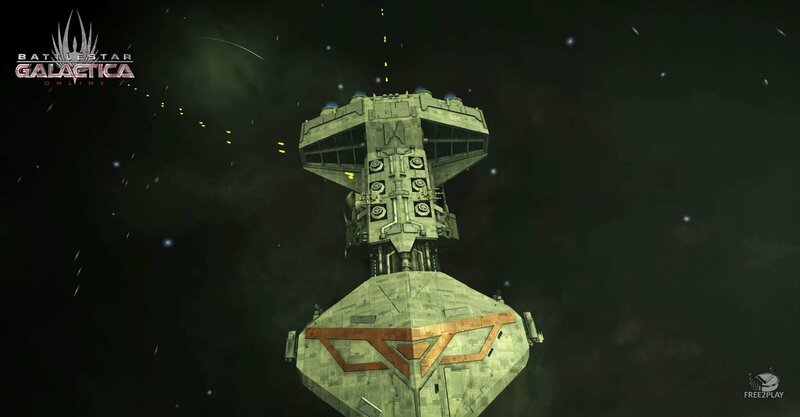 As a Heavy Assault vessel, the Jormung can be equipped with more hull systems than other line ships, further increasing its toughness and defensive capabilities. To gain Tylium, Titanium and water you must mine asteroids (the smaller ones and not the larger ones). The best way to do this is to have the mineral scanner installed. Then you just have to scan the asteroid to find out its content and mine it. If you select an asteroid, then click the scanner the asteroid will have a color flow over it. Once you have discovered if the asteroid is worth mining you can destroy it. Normal cannons do work when shooting asteroids, however mining cannons will do bonus damage to asteroids, and less damage to opponents. Once you are in cannon range then you are free to shoot the asteroid. Once the asteroid has been destroyed, you will get the “loot” box show up.